Weeks before the summer even began, Dr. Bryan Thines, PhD, my research advisor and a professor of biology and genetics at Puget Sound, challenged me to a beard-growing competition. “I like to have friendly games within our labs,” he told me after I received my research grant. “It encourages both competition and camaraderie.” I had already been pranked once by my lab after I misspelled the word “assess” on a poster for a presentation, so I should have assumed that our summer work would be just as mischievous as the previous semester. I and two other students, Lily O’Connor and Tina Chapman, are working hard to characterize F-box proteins in Arabidopsis thaliana through molecular, genomics and bioinformatic approaches. Through weeks packed with genotyping, gels, culturing, cloning, harvesting seeds, and extracting DNA, we have finally begun to identify knockout lines, develop gene constructs, and locate brand new candidate genes for further study. Throughout the hard work we’re putting in at the bench, our lab has found additional ways to entertain ourselves. Any given day often alternates between lab meetings discussing research progress, thesis writing sessions, miniature genetics or molecular biology lectures, bench work, and discussing how many grilled cheeses we have each eaten since our research began (I’m in the lead with 39). 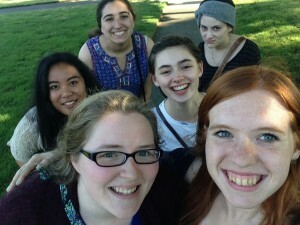 Lily, Tina and I are entering our final year at Puget Sound, and we collectively decided to capitalize on our mentor’s time by bombarding him with questions about scientific writing, life after college, applying to and attending graduate school, how to make the best cup of pour-over coffee. As we enter the penultimate week of our ten-week grant program, our lab has collectively grown countless pots of plants, run dozens of gels, eaten 117 grilled cheese sandwiches, and grown two significant beards. 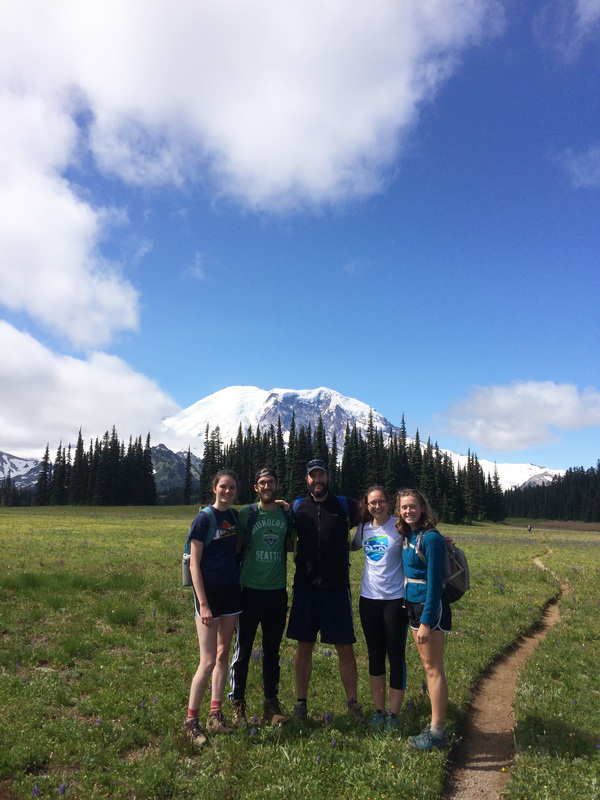 Ryan Apathy’s summer science research at University of Puget Sound is supported by the M.J. Murdock Charitable Trust’s Science Research Program. Sitting on the stones outside the newly crowned Thomas Hall, Banji looked confused as I held up my phone, opened up the camera app, pressed record video, and began prattling off bits and pieces of the day. He glanced between me and the screen and added on details to my recollections. We informed the camera that Maya had wanted to buy four boxes of hot pockets (Banji took them out of her cart because, “She’ll die in a month of hot pocket consumption.”); about the death of Gabe’s phone and his Uber trip to Safeway for a last-minute temporary-replacement burner phone; and our failures in super gluing a car phone mount via a confusing messed up jar lid and Pringles can connection. Immediately after finishing the video, I sent it to Emily. Long distance seems increasingly relevant in college. The beginning of each semester is met with hugs and how are you??? and I missed you and catching up on the peaks of the summer and the mundane everyday. The beginning of my sophomore year was met with friends moving into our Trimble suite all at once and immediate inside jokes and snapchats of hands up in the air captioned “REUNITED.” Junior year, in a way, has begun with a rockier start. Everyone is everywhere, busy around campus, and the best friends I’ve made at college are packing their suitcases to begin their respective semesters abroad. There are gaps that need to be filled and the distance during those months can seem expansive. I’ve gotten in the habit of texting Emily every morning, sending her videos throughout the day, recapping everything that has happened, asking stupid questions, and letting the conversation ramble (a text a sent her last week: “tell me all of the hip 1996 baby names”). The videos fill the gaps of the mundane every day and insert the humor of bad sunburn lines and listening to the Shrek soundtrack; they are I miss you but it’s going to be okay. Do you know your professors? I mean – do you know your professors beyond their names, departments, classes, grading styles, etc.? One of the most valuable aspects of liberal arts education, in my opinion, is the close connection you could establish with the professors. Sure, they could seem intimidating with their crazy educational backgrounds and sophisticated word usage skills, but that shouldn’t stop you from getting to know them. They are always there – willing to help, and get to know you. 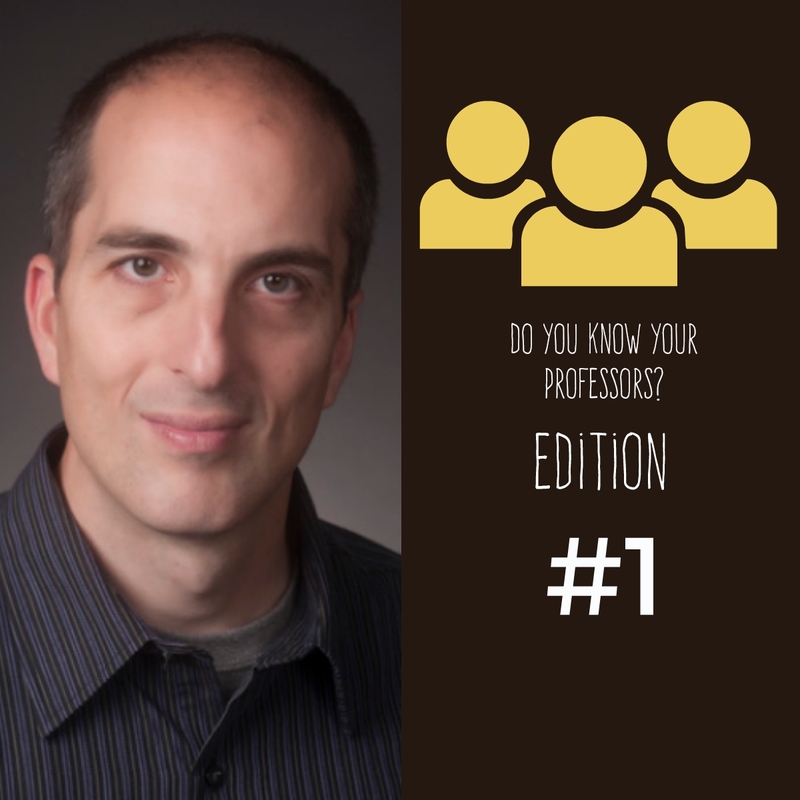 In saying so, I’m presenting you with the first edition of the “Do You Know Your Professors?” Series: Interview with Professor Nick Kontogeorgopoulos, the Distinguished Professor of the International Political Economy (IPE) Department. So, to start off – Professor Konto, did you always want to be a professor since you were young? Well, I knew I wanted to be a professor since my freshman year in college. Fun fact actually, I was originally going to study engineering at University of Toronto, because I was doing a lot of math and science in high school. But I got a four-year scholarship called the Morehead-Cain from North Carolina Chapel Hill, so I ended up going there from Toronto, Canada – where I was in High School. North Carolina Chapel Hill did not have engineering, so I started down another path – thought I’d do International Relations. I enjoyed it very much since First Year, so yea. I knew pretty early on – which was nice. Wait, did you say you grew up in Canada? Yes. I was born in Canada; I grew up in Vancouver until I was 6, then my family moved to Toronto. Oh, but my family is from Greece. My parents were immigrants from Greece, and they met in Canada, where I was born. Wow; I did not know that! And your college experience – was North Carolina Chapel Hill different from/similar to UPS? How? It was totally different, because North Carolina Chapel Hill is a huge research school with thousands and thousands of students. Classes are very large, especially in the first couple of years. So, it was a completely different experience. My first knowledge and exposure to liberal arts was when I got hired to come here. Due to its nature of being a big university, would you say that the relationship dynamic between a student and a professor at North Carolina Chapel Hill was different compared to that of UPS? Yes. It was more difficult to get to know the professor, but the professor to get to know you – it was definitely more difficult, and you had to be a lot more proactive. It was a lot easier to melt into the crowd and be anonymous, which is good and bad, but you had to really make sure you got good education. It was very up to you. You really had to make the choices to make the most out of it. Here at UPS, it is naturally set up in a way to ensure students get good education. How would you define good teaching? What is your teaching philosophy? When I think about good teaching, I think about the teachers that I enjoyed the most, and what those teachers had in common were high level of organization and genuine passion for the material, but also for teaching the material. So – professors who are excited about learning new things to teach, and being in the classroom in front of students. Professors who have good plan, and intensity… I think I responded to those the most – So I try to do that in my own teaching. So, How long have you been teaching at UPS? This is my 18th year. Yea, is it 18th? Yea. It is. Has the school changed at all since you first came here? I think this School has changed, and there are certain things that improved since I have came here, in terms of the reach of the school nationally – its profile – has improved since I got here. You earlier said that you aspire to be a professor who is always excited about learning new things to teach; do you have current research interests? The current research I’m doing is volunteer tourism, in which tourists travel and volunteer for short periods of time; and I’m interested in what motivates them, and what impact they have on the communities. In general, my research is related to alternative forms of tourism. And Lastly, what piece of academic, or even life advice would you give to all of your students? I would tell my students that it is never too early to think about what you want to do down the road. There are lots of options available to students, and it seems like a daunting task, but often students wait too long to think about what they want to do because they are afraid to make decisions. So, many end up very close to graduation without preparations or plans – it might seem early to think about your future, and of course, young people should keep their options open and explore their choices, but at some point, you should buckle down and make some decisions for career. Another – is to not put too much pressure on yourself to have something perfect when you graduate. People shouldn’t feel so pressured to get paralyzed by it. 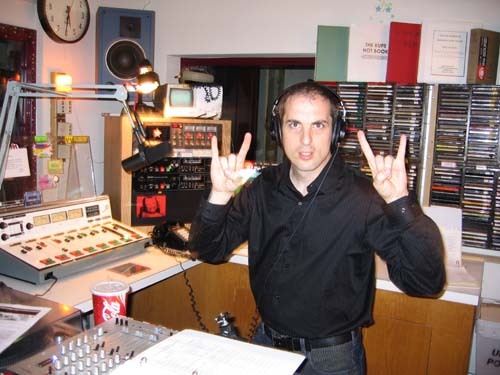 Did you know that, for 10 YEARS, Professor Konto with Professor Jeff Matthews (from the Business department) hosted a KUPS show called “Back and Black” with seventies to nineties hard rock? YES – he is big on music. His favorite band is Rush – the Canadian band, because he grew up with them in high school. He really enjoys classic rock from the seventies and New wave music from the eighties. He also likes some contemporary stuff from England – like the Artic Monkeys, and Brit pop from the nineties – like Oasis. Oh, and of course, disco as well – from the seventies. It’s one of the first things you do when you decide on a college. One of the first things you do when touring a college. A way to say: I am here! A declaration of support for the school, for the memories you’ll make here. It’s the awkward, slightly embarrassed feeling that overcomes you, as you stand and smile and people walk past you. It’s jumping up and stretching your mouth into the widest smile you can manage. Standing on top. Sitting in front. The picture equivalent to the college sweatshirt you wear with pride senior year of high school. The clarification that, no, it’s pronounced “puge-it” not “pug-it.” It’s the grass that is always green and slightly damp. The flowers that are always blooming. I don’t know why I didn’t take a picture when I first toured the school, summer before senior year of high school. The sun was high that day and campus was absolutely gorgeous. On admitted students day there were so many people around and I was so determined to decide, is this the right place for me? to bother with pictures. The only picture I have of that day is me walking in front of Jones, it’s blurry and I’m laughing, because my mother had been lost moments before. (“It’s the brick building,” someone had told her. She had looked at him flabbergasted: “They’re all brick.”) Move-in day freshman year I was too focused on getting everything unpacked. Having my garden-level room feel like home. Meeting people, putting in an effort to make new friends for the first time in years. Coming back for sophomore year, my mom must’ve mentioned it a half a dozen times. “Talena, let’s get a picture in front of the sign!” I nodded at her every time, but never made an effort to actually get the picture taken. I was cognizant of the fact that it is slightly embarrassing, standing up there. It is much less like a goofy picture of you and and your friends and more like a statement: Here we are. It wasn’t until yesterday, while we were waiting for someone to run back for a jacket, that the thought of getting a picture in front of the sign came back to me. “Gaea, let me get a picture of you in front of the sign,” I proclaimed, pulling out my phone. So there we stood at last, grinning and laughing and feeling a bit like idiots in front of the sign, in front of the school we were so proud to go to. I used to see home as a stationary object — a house situated between the ocean and the bay in rural Northern California. Where redwood trees grew in saltwater clogged air and I knew everything, I grew up with it traced on the back of my hand. There was an ode of familiarity: our old parlor stove that spit up flames as we tossed in wood; the drawing I made in kindergarten that my mother refused to take down; my cat, who would be content sitting next to you until you tried to pet her; and the treadle sewing machine my dad brought home when I was eight. I expected that for nine months out of the year we’d branch out. Explore a new place, learn things, gather all of these experiences which we’re told will define our life and then we go back home. Back to our roots, back to everything we knew from before. I forgot that our perspectives would shift. Although I could tell you countless numbers of facts that I learned in my first year here, none of them are the most valuable thing I could say. Instead it’s that I’ve discovered home isn’t a stationary object: it is the way people make you feel. It’s the way I feel here. It’s falling asleep at three a.m. with your friends talking and laughing around you. 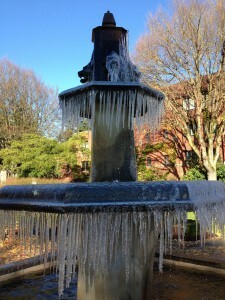 The morning the fountain froze, when we all gathered around it, taking pictures of the icicles hanging down. Making cookies on Pi Day and setting an alarm so you are eating them right at 3/14/15 9:26:53. Running in the rain. Being sung to by a barber shop quartet on a friendaversry. Racing to the bus stop and managing to get there right as it pulls up. Going to Oppenheimer Cafe in the rain, right before closing, when the lights shine just so. Spending hours helping a friend with an essay, for a class that you’re not even in. Tight hugs, long, slow smiles. Playing Justin Bieber’s acoustic album and Nickelback, just because we could. Sitting and starring at the stars. 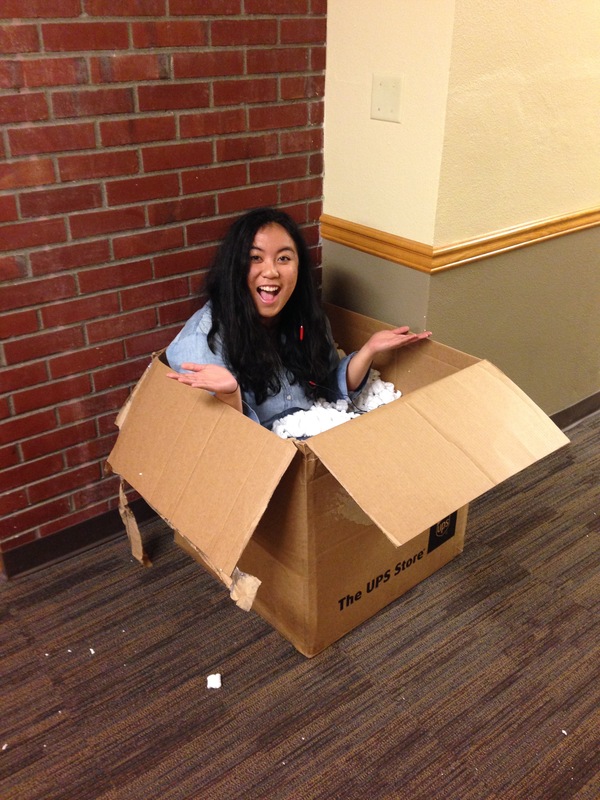 Grabbing a cardboard box filled with packing peanuts and commandeering it. Bringing it into your room. Convincing people to come and sit in The Box. Seeing someone on campus and taking a “SPOTTED” picture. Walking to the Met late at night for The Cookie, just for them all to be gone. Curling up in a blanket, drinking tea, while watching a movie. Hanging a stray sock on a command hook, to see how long it’ll take people to notice. (Sixteen hours.) Waking up early to meet people for breakfast, hours before your first class. And staying up with your friends, even though it’s three a.m. and laughing. The fountain, the morning after it froze. Gaea sitting in The Box, before she brought it back to our room. Going out to dinner for our last meal together before summer. From front to back, left to right: Maddy, Me, Gaea, Maggie, Emily, and Claire. Home is all of the memories I’ve made here and all the memories to come. Hello, I’m Olivia Perry, a senior and Social Media Assistant for The Admission Office. I wanted to share my amazing experience last night that was provided to me by this great school! I was invited by President Ronald Thomas to join him, his wife, Mary, professors, faculty, and students to have dinner with acclaimed Haitian-American writer Edwidge Danticat! 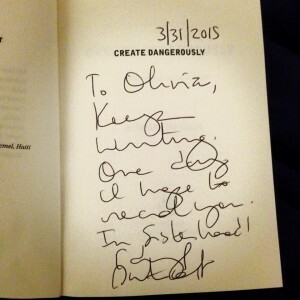 As a Creative Writing major, and as someone who read her in a class at Puget Sound, I was very excited to see Ms. Danticat lecture “Create Dangerously”, and to meet her was a bonus! At dinner, President Thomas opened up the floor to ask Ms. Danticat questions, an opportunity I was quick to take. I first asked when she decided that she wanted to be a writer. 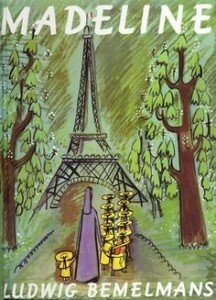 She told us that she was given the book Madeline when she was four. When she realized this was a way to tell stories without verbally telling them, she decided that was what she wanted to do. I later asked if she had any advice for a writing major, a specifically woman of color, and her advice was something that I took to heart. She told me that I just need to write. I should always have a project to work on as leisure. As someone who feels the need to explain herself, a woman of color needs to not be deterred in anyway from what she has chosen to study and create. And as she spoke, she looked right into my eyes, giving me a sense of how genuine she is. 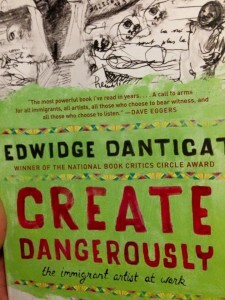 Her lecture, Create Dangerously, named after her 2010 book Create Dangerously: The Immigrant Artist At Work, was not as long as expected but was full of insightful anecdotes and ideas. She spoke of writers becoming the reader and what should and shouldn’t be written about. 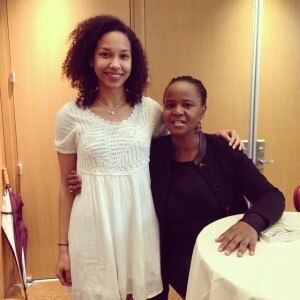 When she was finished, she answered questions regarding education and politics in Haiti and the Caribbean and shared her excitement for the next generation of, not only Haitian, all up and coming Caribbean writers. They were selling her books at the lecture and reception, so naturally I bought one and she signed it for me! Last night was a great event that I would never have experienced if I did not come to this school and become involved around campus. As a senior, I have to say, go to as many lectures as possible! 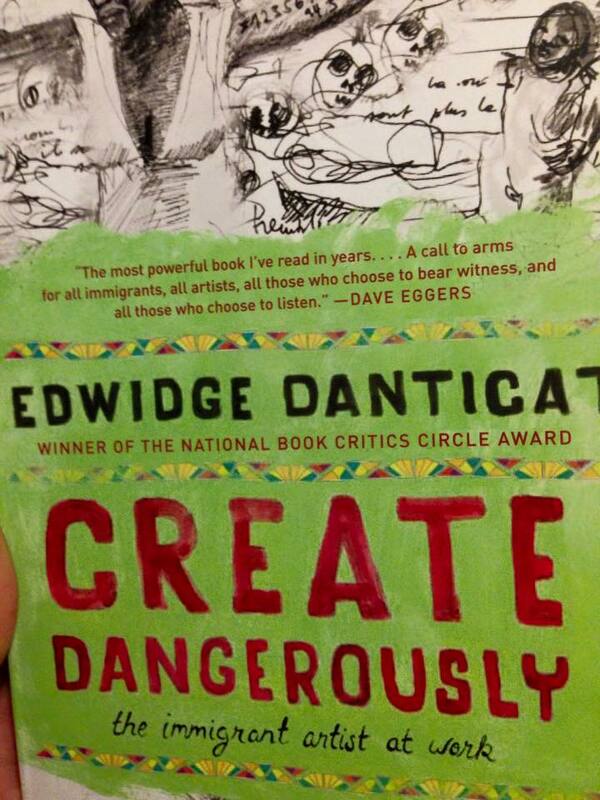 I have gotten to see amazing and well known people, like Junot Diaz and Anis Mojgani, speak in my years here. It is a great opportunity that current and future students should always be taking advantage of! Hello! My name is Casey O’Brien. 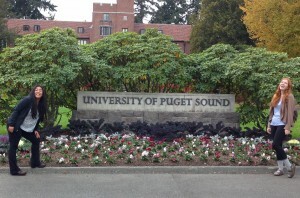 I’m a freshman here at Puget Sound. 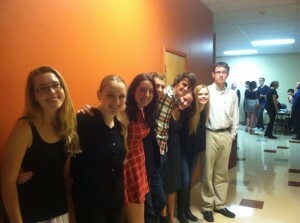 I am a part of the Humanities program. I love theater, creative writing, and the outdoors, among lots of other interests! At this point, I am thinking that I will be a Sociology and Anthropology (SOAN) major with a double minor in Theater and Latin American Studies. I come from the Bay Area in California, so the lovely fog and rain in Tacoma is home to me. I grew up within ten minutes of the SF bay, so I also love being on the coast. I am learning so much here on campus! There’s always something happening here, so there is never an opportunity to feel bored. This weekend was a special one for me, because I was a director for the Town Crier Speaks Festival, our student theater festival, which went up this weekend. Town Crier is a one act festival written, produced and directed by students—it is such a unique and wonderful venue for Puget Sound creativity. My own show, Game of Life, was a truly incredible process. My cast helped me to grow as a person and an artist, and I feel so lucky to have met them. What is so very interesting and dynamic about our campus is that people from so many different areas—ages, majors, etc—can interact and learn from one another. One of my actors is graduating this semester as a Biology major; with my interests, we might never have even met, let alone gotten to know one another, at a different school. At a larger university, or a university that didn’t encourage students to try new things the way UPS does, a first semester freshman would never have directed a one act at all. Town Crier opened on Thursday night and closed on Saturday, which meant that today was definitely bittersweet for me. My parents, here visiting for Family Weekend, went home to California today, but my sadness at watching them go was matched by the contentedness of knowing that I have two homes now, one in Washington and one in NorCal. Our president, Ronald Thomas, aka RonThom, famously opens his speech at orientation by saying “Welcome Home”—and truly, we are. Puget has stolen my heart—from the moment I stepped on campus, doors have been opened for me. This been a weekend of beginnings, endings and special moments. When my cast handed me the big bouquet of red roses they had bought for me, a handwritten card on top, I felt like crying for joy and sadness all at once—which is a good sign. 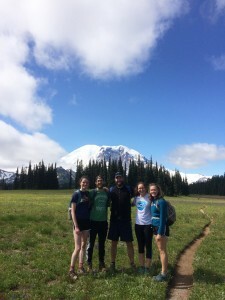 Puget is a place where students will make connections, will feel deeply. Loggers are genuine, and they throw themselves in. In the spirit of the Northwest, we’ll always go on an adventure. We show up—as Town Crier’s full house and standing ovation testifies. This has been a weekend to remember…. Just as so many here are. Undertaking a long, multi-step project or process often involves unforeseen difficulties. While these challenges can be similarly frustrating to experience, combating them often necessitates a very different set of skills. Some problems require patience, while others require rapid ingenuity; other problems are best viewed through a creative lens, while some should be addressed as methodically as possible. However, solving problems effectively can often default to a simple formula: one tries various solutions, fails, and subsequently bases future attempted solutions off of previous failures. In the context of my research project, the largest challenge that I have had to deal with is recruitment. Participation in my study is limited exclusively to students at UPS, and since a large percentage of students go home during the summer months, I have a small potential sample size to draw from. However, there are still more than enough students for me to reach my minimum goal of 40 participants, as well as my ideal (and wildly optimistic) goal of a sample size of 80 participants. Despite the fact that I am offering $5 as compensation for participation, it has been difficult to find a steady flow of participants. I initially thought that it would be sufficient to advertise solely via flyers placed around campus that advertised my study. Theoretically, the allure of getting $5 for 30 minutes of participation would be too much for some students to resist, and I would be overwhelmed by potential participants clamoring to get a piece of the action. In reality, the experience thus far had been vastly different. I’d be lying if I were to say it wasn’t a little bit of a letdown when, after putting up my flyers, I received little to no interest in the first week. However, I also knew that in order to optimize the number of potential participants, I needed to undertake a more active, personable, and tangible recruiting process. The frenetic pace of daily life makes it difficult for a student to pay attention to every poster or flyer that they see, much less consciously decide to consider the information that it displays. By deciding to go around to summer classes and actively present about my research to students, I knew I had a much better chance of engaging them. If I were going from classroom to classroom, handing out surveys, and simply asking students to fill them out, I would have no problem; people are not inherently opposed to participating in research studies, nor are they inclined to not want $5! However, participation in my study is different – it requires conscious effort – potential participants have to clear space in their schedule, contact me to set up a time, and show up and participate. That’s a significant amount of work, with a relatively small incentive; I can completely understand how other concerns and interests can make prioritizing research participation an afterthought. Despite these initial setbacks, I am determined to continue working to get as many participants as I can. While it can be difficult at times, every single person that I get counts, and I frequently have to remind myself that, quite literally, “they all add up”. Hopefully the coming weeks will see steady, progressive participation as I look to reach my goal of 40 participants! 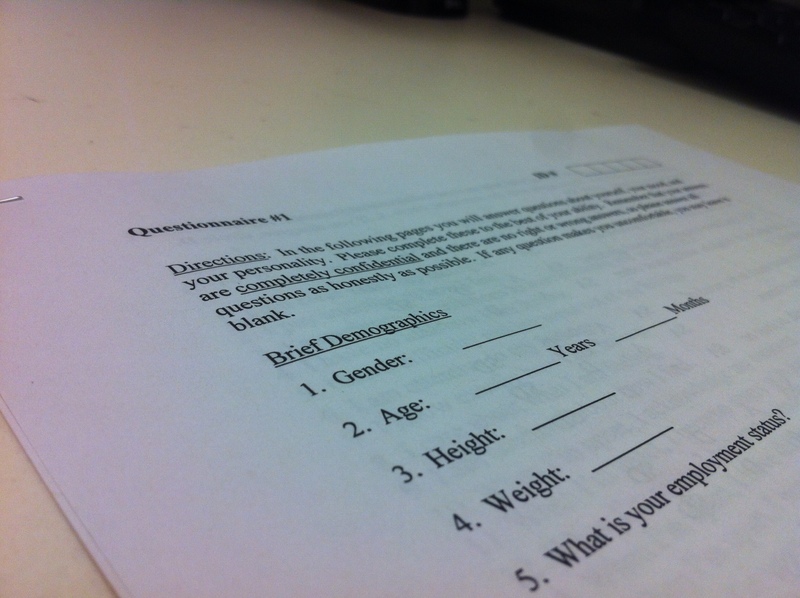 A brief demographic questionnaire from the study. Hi everyone! I’m Stephen Baum, a rising senior and psychology major. This is my first ever blog post, as well as my first summer conducting research independently, which, initially, was a slightly daunting prospect. While I was incredibly excited and humbled to have received a summer research grant, I was anxiously aware of the challenges that lied ahead. Somewhere along the line, I visualized myself drowning in a sea of journal articles that I was hopelessly inept at trying to interpret. However, thanks to the support of my advisor, Jill Nealey-Moore, (Ph.D, Psychology) I have neither downed nor am I (completely) inept at reading and analyzing articles; thus far, the research process has been fantastic and extremely rewarding, albeit challenging. While I can’t speak entirely about the specifics regarding my research, as I am still running participants and don’t want to compromise the scientific validity of what I am testing, my research generally examines how an individual’s mood alters as a function of various tasks that they perform. Participants in my study come into the lab, complete several written exercises and questionnaires, and are then compensated for their participation. The study in its entirety takes around 35 minutes, which, figuratively speaking, is in a “sweet spot”; long enough to comprehensively examine how the tasks influence mood without leaving a participant overly fatigued and potentially compromising their ability to concentrate. As a whole, my reflections on conducting research thus far are positive. It is very apt to characterize a considerable portion of the research process as unglamorous; for every significant finding or “eureka” moment, there are hours and hours spent in the lab, at the computer, or the library, meticulously sorting through the world of online publications, struggling with the margins on a set of questionnaires, and agonizing over the heading on a written activity. Research is inherently painstaking, and it highly prioritizes attention to detail; those that put in extra effort will be rewarded with the most fruitful, and often, most unexpected findings. Since a significant portion of the validity in experimental psychological research rests in ensuring that each participant in the study has as identical of an experience as possible, minutia cannot be ignored. In this way, routine is a researcher’s best friend, as the experimental procedure for each and every participant follows a pre-drafted “script” that standardizes language and controls for deviations. While some may find this monotonous, the process is incredibly inherently satisfying for me, as I get a certain gratuitous please out of agonizing over organizational details and running a participant directly according to the script. Additionally, being able to work in such close proximity to Jill and pick her brain has considerably advanced my academic development. The axiom “work smarter, not harder” comes to mind – while research does require you to work (very!) hard, which Jill demonstrates, it rewards innovative, critical though and harnessed spontaneity. Observing Jill’s careful and analytical reasoning has enabled me to grasp the value of such traits in an experimental setting. Watching my thought process systematically evolve from when my research project was in its fledgling stages has been incredibly gratifying and empowering. I believe that largely due to the help of those around me, I’ve been able to progressively develop a variety of skills that will benefit me even outside of an academic research setting, such as the ability to problem solve in difficult situations, or ration time and resources in an advantageous manner. So that is about it! Hopefully I can keep everyone up to date with my adventures in the lab as my study progresses. I’m looking forward to being able to speak more freely about the semantics of my research and the theory behind it. Stay tuned! Over winter break, I put together a small game for the iPhone and iPad called Bird Bounce. It’s an infinite runner game of the Temple Run variety that replaces running with flight, which I’ve conveniently dubbed an ‘infinite flyer’ for lack of a better name. You fly through 3D worlds as a penguin, jumping across platforms, collecting coins, and unlocking levels. If you’d like to try it, here’s the link to Bird Bounce and a short promo video. I thought I might briefly describe the process of developing and releasing a small game. It was definitely different from what I expected. The idea started when I realized everyone around me seemed to be talking about 3D games. From our school’s computer science club to an English professor who wanted to make one, 3D games were the thing. I’d always thought that 3D games were impossible to make quickly, but I’d heard recently that there were some new tools that simplified things a lot. So I realized that after years of dabbling in 3D design I should finally bite the bullet and try to learn how to develop a game. After hours spent trying to make a simple prototype, I came up with what seemed like an utter failure. I had a strange black and white bird that bounced instead of flew… infinitely. It was then that it dawned on me what I had really gotten myself into. I should have seen from the start that 3D design might require some artistic ability, but it hit me a few weeks in that most of this process would require artistic skill. And if there’s one thing I can do, it isn’t visual art. But I got over this hurdle somehow with the help of software that makes art possible even for those truly not inclined. My brother saved the day, too, by making my game icon and several of the scenic elements, and he is, in contrast, artistically inclined. Thanks, Steve, for saving the day! I was finally back in my comfort zone when it came to composing the game music… music’s something I’m at least familiar with. After a few hours of culling together and orchestrating loose ends of songs I’d tinkered with and liked but never been able to package into anything, and composing a few new pieces as well, I had a basic score ready for all the game levels. Of course, when it comes down to the deadline, it’s the little things that you don’t anticipate. My goal was to finish the app by the end of winter break since I’d be on to new projects after that. Making mountains, snow, programming movement all paled in comparison to the amount of work involved in formatting the score text so that it was just close enough to the edge of the screen without being slightly out of view, or diagnosing a bizarre new bug that hadn’t existed moments before that made penguins fly backward. As the clocked ticked toward my final deadline, I eventually had to make a few compromises (that’s not a bug, it’s a feature! ), but I had something that I could call final. Better than that, I had built a 3D game, and now I could respond to those wanting to build their own 3D games knowing a little bit more than I did before.